On a work site, everyone needs to wear the proper work footwear. Fall rainstorms are going to make metal surfaces slipperier. Even on more solid ground, you never know what could happen. On a work site, everyone needs to wear the proper work footwear. Different shoes are required depending on the circumstances and environments you, your employees, and your visitors might encounter. What hazards are present on your site? These dangers are the reasons you need the proper footwear in the first place. Although the traditional steel-toed boots might provide enough protection, sometimes they just aren’t the right fit. Safety standards have been arranged to indicate what types of footwear are best. For instance, ASTM F2413 outlines the design, testing and classification requirements for protective footwear. Now that you know more about how to choose the best boots for your site, what hazards should you take care to prevent or avoid? Electrical Wires: As we have previously discussed, electrical safety is a significant concern. For anyone who works with live electrical wires or circuits will need shoes that resist shocks and don’t conduct electricity; these shoes will reduce the chances of injury or death due to electrocution. Chainsaws: If your site focuses on concrete sawing or other situations that call for chainsaws, you should also be aware of the safety measures you need to remember to handle these saws safely. Chainsaw boots are made to prevent injury from accidental cutting due to saws or other spinning blades. Something Falling: Watch your head! Tools and debris could be falling from above. 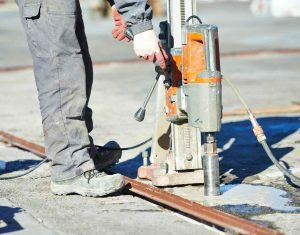 Aside from headgear such as hard hats, you should also wear boots with safety toes; as you can probably guess, steel-toed boots belong to the category of safety toe boots. Arch and ankle support are just as critical for work footwear as they are for everyday shoes. You and your employees should be able to stand for several hours and walk around without pain or discomfort, mostly because the long hours spent on a site will likely involve plenty of movement. If an emergency should happen, you’ll also want to be sure everyone can evacuate safely without tripping or falling. This entry was posted on Friday, October 13th, 2017	at 1:30 pm	. Both comments and pings are currently closed.